In 1992 Andrew Veyette joined his older brothers Michael and Francis to study at Westside Ballet with Rosemary Valaire and Yvonne Mounsey. He danced in Westside Ballet’s production of The Sleeping Beauty as The Bluebird (1997). In The Nutcracker he danced as Toy Soldier (1995 and 1996), solo Russian and Spanish (1996). In 1996, he earned a scholarship to the School of American Ballet, the official school of New York City Ballet. Andrew joined New York City Ballet as a member of the corps de ballet in spring 2000. 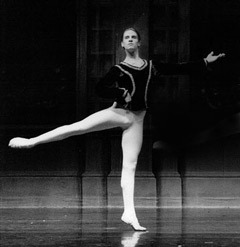 Andrew returned to dance as a guest artist at Westside Ballet’s 2002 Gala. Evidently Kourlas wasn’t the only one who noticed Andrew’s talent: in March 2006 he was promoted to soloist. In May 2008 he was promoted to principal dancer. Read Pauline Golbin’s interview with Andrew, shortly after his promotion. See Andrew’s page on the NYCB web site.